As test and college prep courses aim to get students into the right colleges, Modern Guild aims to do the same for the right careers. 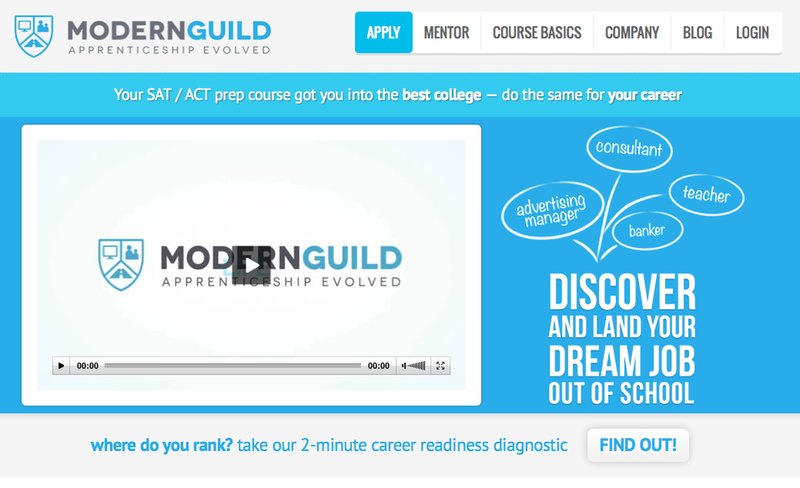 Targeted at high school and college-aged students, Modern Guild offers online courses that connect students with industry experts and allows for exploration of interests and development of the right skills and experiences. Partnering with top schools and universities around the country, Modern Guild aspires to transform the way students launch their futures. Modern Guild was recently accepted into the inaugural Kaplan EdTech Accelerator and will be spending the next few months in NYC. Today, CEO Adrien Fraise shares his thoughts with us. Tell us about the decision to apply for Kaplan EdTech Accelerator. Modern Guild is a career accelerator for high school seniors and college students, so it made all the sense in the world for us to look for an accelerator as well. Because Modern Guild is solving a very big problem and influencing young people’s lives, it is imperative for us to be as complete a company as possible. This means going beyond having an innovative and effective service offering, but also making sure we are equally excellent in all phases of our operation from customer service to financial strength. And while the Kaplan EdTech Accelerator certainly speeds a company’s progression, we saw that it could be just as effective in making sure Modern Guild has the strong foundation required for continued growth in the future. Tell us about Modern Guild. Modern Guild just launched and already we have had great results. Over 200 college students and high school seniors participate in our online career mentoring services, and we have strong partnerships with top universities and prep schools. We give students access to experienced career counselors and industry pros who mentor them in one or more of our three highly structured curricula. Students will typically begin with our Exploration program while high school seniors, during which time they will learn more about themselves and careers that align with their passions, interests and skills. Once in college, we offer an Immersion curriculum, in which they dive deep into a few suitable careers to identify the right path for them, and an Acceleration curriculum, where students select a career path and build a portfolio of experiences that make them insanely attractive candidates. What market does Modern Guild attack and how big is it? Modern Guild’s market is everyone who wants to get a great return on their college investment – which is really all of the almost 20 million students in college today. We go after the market by partnering with innovative high schools and top universities who then make Modern Guild available to their students. This model is easily extendable outside of academic settings, and we hope to work with organizations outside of education, as well, such as community groups, churches and even with businesses looking for qualified entry-level candidates. What is your take on the current interest in the EdTech sector? The problems in the education sector, whether K-12 or higher education, are well-documented and daunting, and you can’t help but get excited by the potential for technology innovations to solve them. Specific to Modern Guild’s market, the problem is that over half of college graduates under the age of 25 are unemployed or underemployed. Why? Because there is a huge disconnect between what graduates learn and what they need for the real world. We are getting interest because we address this huge and very costly problem – and because technology allows us to provide a high level of service at an affordable price point to this giant market. And let’s not forget that in addition to the excitement of solving big problems, investors understand that with 20 million students in colleges today, there is enormous market opportunity. What are you hoping to get out of the program and where do you see Modern Guild fitting in the New York landscape? Modern Guild works with students, career offices and employers around the country, and they will always be our primary influences for how we build out our one-on-one online career mentor services. However, sometimes the best ideas come from those outside of your industry, and there are so many outstanding people in the Kaplan EdTech Accelerator, both mentors and other program participants, we can’t help but improve by being a part of it. As for how Modern Guild fits in the New York landscape, the startup scene here is booming and rivals other cities that may be better known as startup hubs. So that certainly has helped heighten the interest in what we are doing. And at another level, I think it just makes sense to be here as every year the best and the brightest college graduates descend upon New York City to make their mark, and Modern Guild’s job is to help them know what their mark should be.